Tomorrow Is Yesterday may, on the surface be something of a throwaway episode with its low intensity, light humour and nonsensical plot. 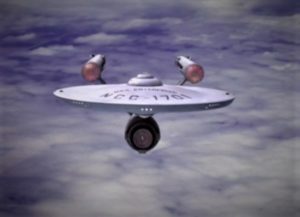 However it remains a much loved, fun episode of Star Trek The Original Series which leaves something of a legacy. On their return from a brief hiatus, Terry, Graham and Derek discuss this first season episode. Its high points, its low points and as an added treat: some bonus misogyny from Spock.